A few weeks back, we took the kids downtown during Fiesta week to go to the River Parade. They were serving some delicious tex-mex options in the section where our seats were located. They had fajitas, as well as bean and cheese tostadas. The kids had never had a tostada before, as I rarely made them in Ohio because the tostadas were quite expensive. Now that we are here in south Texas, there are tostadas practically on every corner, and they are cheap.cheap.cheap. So I’ve added them to the “regulars” section of my grocery list. My grocery list consists of “regulars,” or items that I buy every week, along with deep discount and sale items like produce and BOGO offers, and lastly the “stockpile” section for products that I can get free or nearly free by matching sales with coupons or other store offers. Two of the 3 older boys love refried beans on the tostadas…just like that. The other turns his nose up at beans, so he likes the other toppings. And while I rarely “short-order cook,” this meal is great…as the kids got to pick what they wanted on top! Other topping ideas include: sour cream, black olives, shredded lettuce, chopped tomatoes, red beans, avocado chunks. This meal really just came together…I had all the right fixings and ingredients in the pantry to make a well, rounded and delicious dinner that we all enjoyed! 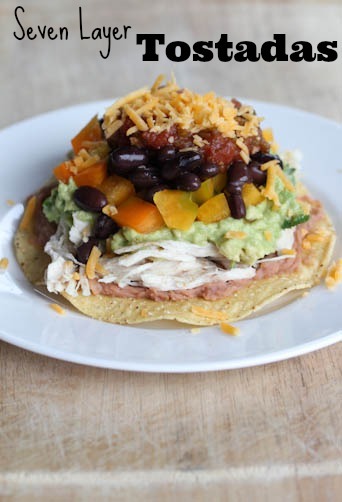 What would you put on your Seven Layer Tostada?!? Prepare the chicken if need be. Or pull it from the freezer. Spread the refried beans on the tostada shells. Prepare guacamole by mashing avocado with the ground cumin and lime juice, season to taste with salt and pepper. Continue to add toppings, as you wish. These look easy and delicious. Thank you! Wow! does that look Delicious. I am going to ask my wife if she wants to have this for dinner tonight (or maybe tomorrow night). I have never seen your blog before but plan on keeping up with other $5 dinners. How do you eat these? Knife and fork like a salad til you reach the bottom and eat the shell for dessert? How do your kids eat these? Eons ago at Taco Bell they used to make a bean tostada that you picked up and ate like a mini pizza. Not to be confused with the mexican pizza they serve today. Regarding making the tostada base: I just bake corn tortillas till they are starting to get a little brown when we want tostadas. They crisp more as they cool. You can spritz them with oil before baking if you want them a little more like the commercial version. You can also just pile everything on your plate and surround with tortilla chips to get all the same flavor notes.